The Netherland’s thrashers strike again. Three years after the release of their previous record, "Cult Of The Dead", they unleash their new studio effort,” Descent Into Chaos’, and it has everything you would expect from this band. 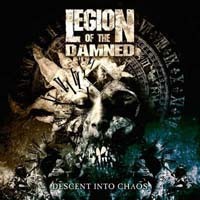 After listening to the album, I’ve come to the conclusion that if bands like MOTORHEAD, AC / DC and the ROLLING STONES could have made records that sound just as the old ones and still make the fans like it while thinking they are the greatest, so could LEGION OF THE DAMNED. Don’t get me wrong, the record is a good solid Thrash / Death album with a modern touch yet it doesn’t bring nothing new to the table. The opening track, “Descent into Chaos“, is an epic cool intro that sets the vibe to the whole record. Straight from that point, from the second song “War Is In My Blood” there is an orientation to KREATOR's style but with a modern twist. Same goes to the rest of the record's sound as it shares common elements as the old ones. This band really likes the German Thrash scene but with a more sophisticated twist merely influenced by DEATH. After two or three songs I realized that I haven’t heard any guitar solos! And that really turned me off. Virtually, I don’t think that all the songs in the world need a guitar solo but when there is a C part in a song that just demands a guitar solo and… it’s not there, you would probably get the feeling that something is missing. Even though the band didn’t have solos in the older albums, I think that is one of the things that is missing in LEGION OF THE DAMNED's music. To exemplify, it is like when you listen bands like KREATOR, DEATH and EXODUS and you wait for the shred guitar solo. It doesn't really have to be something complicated. It can be a SLAYER type of solo as it could have been excellent on almost every song on this record. “Lord Of The Flies”is my favorite tune on the record, it started with a good acoustic intro and then turned into a good Thrash Metal song, not excellent because in my opinion a good shred guitar solo could have made this song a perfect 10. In conclusion, the album is good, and if you’re a LEGION OF THE DAMNED fan you’ll definitely have to hear this one. The production is a little to raw for the present, but maybe because of the fact that the older records sounded very modern. It may look like a step back, however it is something that a lot of bands are doing nowadays. The best thing on the record is the insane drumming of Erik Fleuren that just ripped the hell out of his drum set. Overall in you like the older LEGION OF THE DAMNED albums, you will definitely like this one so go on and buy it.